Here at GeoArm, we provide reliable, secure, and redundant central station monitoring services. Over the years, we have monitored thousands of homes across North America against burglary, fire and carbon monoxide emergencies. With unlimited zones, rest assured knowing your family and property are safe and protected at all times while making you eligible for a homeowner's insurance discount. In some cases, this discount can cover the cost of your alarm monitoring service. All of our professional central station plans connect your system to a live operator, 24 hours a day, who can call the proper authorities (police, fire or medical) for dispatching in case of a confirmed break-in, fire, or any other type of emergency. Our live operators are always there when you need us and best of all, no-term contracts, third party bills, and no hidden charges! &check;Low Price - At less than a third the price of our competitors, we keep you protected without taxing your wallet. 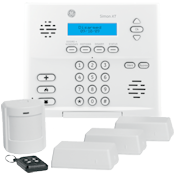 By providing remote alarm service, we also save you the cost of expensive and time consuming onsite service calls. If you own a home or a business, monitoring services start at only $10 a month! GEOARM has a wide range of security solutions to help you take control of your home security and protect your valuables and loved ones. Easy to install wireless security systems, wireless video surveillance cameras, and can all help to make your home more secure. 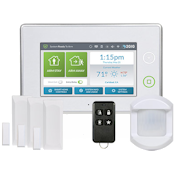 Households without security systems are about three times more likely to be burglarized than households with security systems. Also when a home is broken into, the losses are nearly $400 more in the home without the security system than in the protected home. Burglars want easy targets when choosing a home to burglarize, and if your home has a security system with a security yard sign in the front yard, chances are they will move on to another target. Of course, simply having a home security system is not enough. The system must be designed, programmed, and installed properly; and you must arm it correctly every time you leave the home. 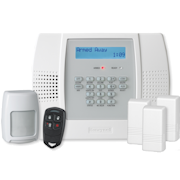 Security systems designed and programmed by GeoArm provide the peace of mind you have been looking for. 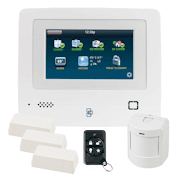 You have many options these days when deciding which home security system to buy. The first choice you must make is whether to go wireless or not. For years, hard-wired systems were the only option. Unfortunately, installing a hard-wired system is costly and time consuming; and if it is done after construction, it requires drilling through walls and complicated wire runs throughout the home. Another problem with hard-wired security systems is that many sensors are wired together onto one zone. For instance, every window on the second floor of your home may be wired into a "2nd Floor Window" zone. When a sensor goes bad, you have to test every single sensor on the second floor to determine which one needs replacing. Even more importantly, if your system is monitored, when the Central Station gets a "2nd Floor Window" alarm, you and/or the police have no idea which window was violated. 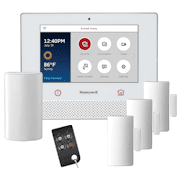 Fortunately, wireless home security systems have come a long way in the past few years and, with proper maintenance, are now just as reliable as hard-wired systems. 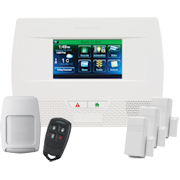 Each sensor on a wireless security system is constantly checking in with the control panel, so you and the Central Station know right away when a sensor goes bad or loses battery power. Also, each sensor is a separate zone on a wireless security system so that when the Central Station gets an alarm, you and/or the police know the exact window or door that was violated. 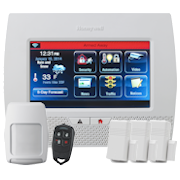 Perhaps the most important advantage of a wireless home security system is that the installation is so easy you can do it yourself. 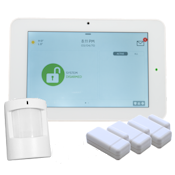 You no longer have to pay for an expensive alarm technician to install your home security system. The most technical part of the installation would be screwing in the devices with wall anchors and screws if you didnt want to use the supplied double sided tape or industrial strength Velcro. You can now avoid damaging your home with a complicated hard-wired installation without sacrificing your level of home security. Finally, the hard-wired security systems being made today are using the same basic technology as twenty years ago. 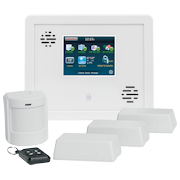 Wireless security systems, on the other hand, are made with state-of-the-art technology that can further separate them from old-fashioned hard-wired systems. Designing a Wireless Home Security System is Easy! When designing your wireless home security system there are three different types of protection to consider: perimeter protection, interior protection, and environmental protection. 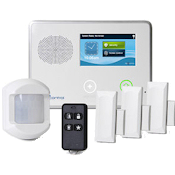 Perimeter Protection  A secure home would have its entire perimeter protected, so that the wireless home security system detects the break-in before the burglar has actually stepped foot inside the home. Security using perimeter protection is the most effective way to limit losses from a burglary, as the criminal will almost always leave as soon as the siren has sounded and before he has entered the home. To secure your entire homes perimeter you need to place a wireless contact on every window and door that opens to the outside. A wireless door/window contact consists of a wireless transmitter with a built-in reed switch and a magnet. The transmitter is mounted on the door/window frame and the magnet is mounted on the door/window so that when the door/window is closed the magnet and reed switch are in contact. When the door or window opens, the circuit is broken and it triggers an alarm at your wireless home security systems control panel. For some people, contacting every window or door is too expensive. In this case, GeoArm recommends contacting at least every door, as a door is the most frequently used entry point in a burglary. From there, we recommend contacting any windows that are obscured from view and would be attractive entry points for an intruder. Interior Protection  The most secure home would not only have its entire perimeter protected, but would also back up that perimeter protection with interior protection. Contacting every window and door only protects your home from a burglar that opens a window or door. If a burglar breaks the glass on a sliding door or picture window and climbs through the broken pane, the contacts transmitter is never moved away from the magnet and no alarm will sound. For this type of forced entry, you need a different type of home security system sensor. 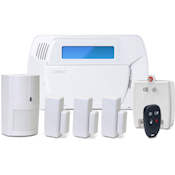 Wireless motion detectors and wireless glassbreak detectors are two kinds of wireless home security system sensors that can provide interior protection. Wireless motion detectors use either microwave technology, passive infrared technology, or a combination of both to sense motion and provide home security. The motion detector should be installed in main living areas, hallways, and any rooms that have high value items. If an intruder were to break through a window pane or glass door and bypass the door/window contact, they would be detected by the motion detector and the alarm would sound. For homes with pets, there are also pet immune motion detectors that have lowered sensitivity so that the detector will only be triggered by a large moving object. Motion detectors can also be a good option for rooms with a lot of windows when it is too expensive to contact every window. Instead of paying for 6 window contacts in a living room with 6 windows, you could install one motion detector in the corner of the room and be confident that you will detect an intruder once they have climbed inside the room. Once again, the most secure installation would be a window contact on every window backed up by a motion detector in the room. We understand that can be expensive, so for the cost-conscious customer GeoArm suggests using motion detectors instead of contacting every window. 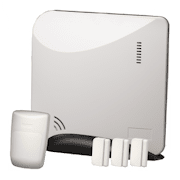 Wireless glassbreak detectors are a second type of interior protection. A glassbreak detector is a home security device with a microphone that detects the actual frequency of broken glass. When a burglar breaks a window pane or glass sliding door the microphone detects the frequency of the shattered glass and triggers an alarm. Glassbreak detectors should be mounted on the opposite wall of a window or row of windows. These sensors provide another layer of home security in addition to door/window contacts in the event an intruder climbs through a broken window pane without opening the actual window. Also, they are good for installations in homes with large pets where motion detectors would not be a good choice. Just as one motion detector can replace the need for multiple window contacts, one glassbreak detector can do the same thing. GeoArm always recommends protecting every window and door with a wireless contact and backing that perimeter protection up with some interior protection (wireless motion detector or wireless glassbreak detector). However, for a less expensive installation we recommend using more interior protection when it is not in your budget to contact every window and door. Environmental Protection  To extract more value out of your wireless home security system, consider adding environmental sensors to your system. With Geoarm, you will pay the same monthly fee for to protect against burglaries as you would to also protect against fires, carbon monoxide poisoning, water damage, and damage from extreme temperatures. Home security is more than just protecting against a robbery; GeoArm provides protection against any emergency. Most homes have local smoke detectors that were installed when the home was built. The local smoke detectors act as life safety devices that will sound a loud alarm when smoke is detected. They are meant to wake up anyone that may be inside the house when a fire is occurring. Unfortunately, they do nothing to protect the actual home or the belongings inside the home. With a monitored wireless home security system that has heat and smoke detectors installed, you give yourself a chance to save your home and belongings in the event of a fire. When the sensors detect smoke or heat, the home security system alerts the Central Station to the threat of fire. The Central Station then dispatches the fire department so that your home may be saved. Wireless carbon monoxide detectors are a type of environmental protection that can save you or your family members life. The detector plugs into a standard wall outlet and sets of your home security systems alarm when a certain threshold of carbon monoxide gas is detected. These sensors work so well and are so important that many jurisdictions are beginning to require them for every new home security system installation. A water detector or temperature sensor installed on your wireless home security system can protect you from additional property damage. A water/flood detector alerts the Central Station when water is detected and can notify you or an emergency contact that a flood may be occurring at your home. This allows you to respond as soon as the problem arises, as opposed to coming home to the shock of a flooded home. A wireless temperature sensor can provide further environmental protection by alerting the Central Station to unusually high or low temperatures. This type of monitoring could save you from burst pipes, loss of refrigerated produce, damaged electronics, and any other temperature sensitive emergencies. Get more out of your wireless home security system by adding environmental protection sensors. If you are already paying to have your wireless security system protect your home from burglary, why not add these environmental sensors to protect yourself and your home from additional risks?